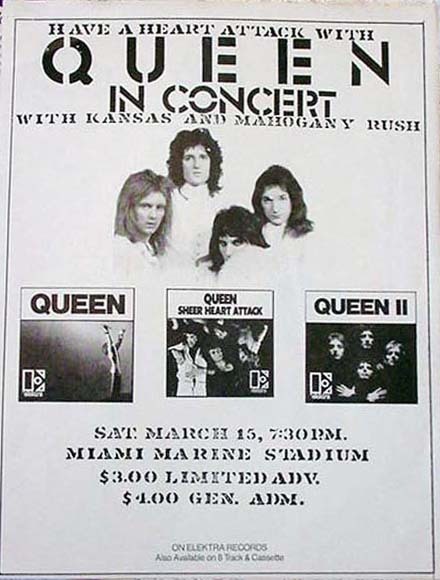 Queen's first US outdoor concert was originally scheduled for March 15, but it was pushed back two days due to rain. Kansas was unavailable that day, so Mahogany Rush was the only opener. A fan who attended the show tells it differently. He says the show on the 17th got rained out half way through and that Queen hastily booked the venue for the following night and played a full show, honouring tickets from the previous night's show. In a world where concert venues are booked well in advance (and aren't cheap), this seems quite unlikely. A couple excellent photos from this show can be found at http://jon-van-woerden.photoshelter.com.